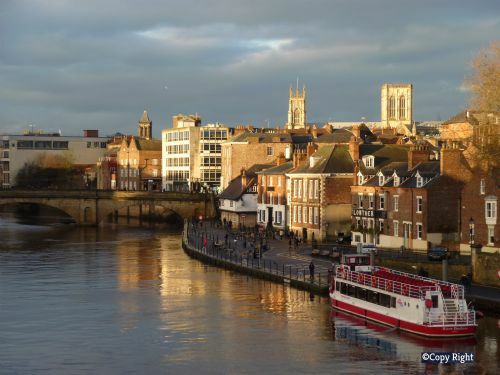 An immaculately presented 2nd floor riverside apartment with probably the most impressive views in York, including River Ouse, York Minster, Cliffords Tower, Skeldergate and Ouse bridges. Located within York’s medieval city walls. Two minutes walk to city centre and nearby restaurants. 18 Emperor's Wharf is a very unusual holiday apartment... it actually lives up to all the superlatives written about it! The two bedroom, two bathroom, kitchen plus lounge are all very good size and fitted out with modern appliances which are maintained in good working order. The secure basement carpark has a good sized lift to take you and your luggage directly to your floor. The deck, which comfortably seats three, is ideal to sip a glass of your favourite beverage while watching the sightseeing boats drift by or the energetic rowers out for their training, all narrowly missing the local Swans and Geese which effortlessly glide across the surface paying no attention to anyone! 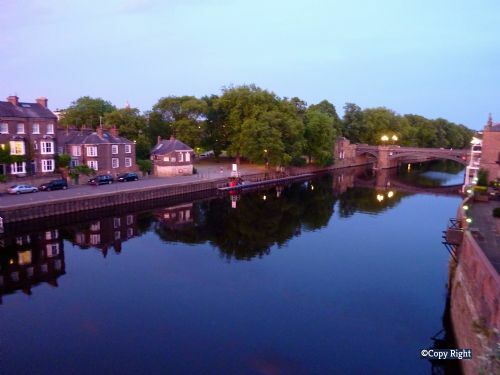 Being on the second story affords a great view from the Ouse Bridge all the way down to Skeldergate Bridge, including the pub that floods and the main wharfside so familiar with tourists exploring the city. Be sure to keep an eye out for the ghostwalk groups that wind their way alongside the river each evening at 8pm! The staff at InYork Holidays are locals who operate out of an office not ten minutes from the apartment and the housekeepers are easily contactable and also only minutes away. You are in very safe hands which is very reassuring when on holiday. We found all of the team to be thoroughly decent, nice people who take pride in providing a quality holiday for us, their clients. This was the first time that we have used "In York Holidays" and from the outset they have been a delight to deal with. All of the team have been so helpful and accommodating. It was great to be able to pick up the phone and speak to someone who had all the answers! After a long drive to York, Richard waiting for us at the apartment was so welcoming and he was so helpful as well. The apartment was simply the best apartment we have ever stayed in. It was so clean and comfortable and a perfect location for exploring York. Being able to securely lock up our car meant that we parked it when we arrived and didn't use it again until we left. York is a very interesting and lively city and a joy to visit. All in all we couldn't recommend In York Holidays or this apartment highly enough and we will definitely return! All in all a 10 out of 10 holiday. The apartment was very clean, comfortable and had great views over the river. Richard made us feel very welcome and it was lovely to have a stress free journey and arrival. The secure parking also meant we could take our time bringing luggage up to the apartment (by lift). Sitting on the balcony watching the world go by on the river was a real bonus. 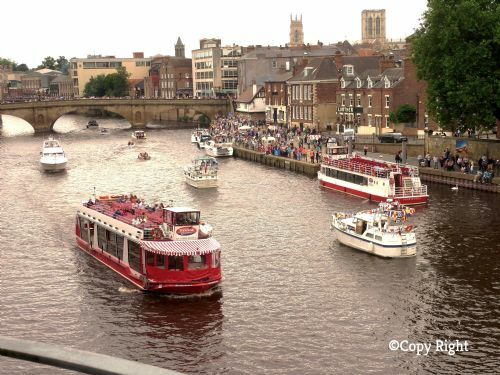 I hope to return to York next year as I loved the close proximity of the apartment to the centre of everything. Thank you. We really enjoyed our four night stay. The apartment is situated on the river and within walking distance of most attractions. Would have been even better if the weather had cooperated! The apartment is reasonably spacious and well equipped. If I had one complaint it is the parking spaces are really tight, but at least I had one. All the staff I dealt with were very friendly and professional. Great stay and will probably stay again. Excellent secure location for accessing all tourist sights in York. We stayed for one week, part family visit and part holiday. We found the location to be excellent for all the many sights of interest in York and also handy for train journeys to Leeds etc. It was also easy to get out of York for car trips. The facilties in the flat for the two of us adults were good. Views superb. We suggest a magnifying mirror would improve the bathroom - otherwise perfect. Reason for our 4th visit in York was to celebrate 79th and 80th birthdays. Great apartment with great views and a great city where a car is not needed. On arrival we were warmly met by Richard who provided a detailed explanation of the apartment and what to do if there were any problems. One small snag was when asked by email to forward arrival time and mobile number, our email reply prompted a response informing us that Clare did not exist. On telephoning In York Holidays we soon established that Clare does exist and proved to be very helpful. The lovely weather added to a wonderful holiday. This is the 4th visit to this flat and again I have no complaints. The Flat benefits from excellent housekeepers - you only have to open the cupboard containing the glasses to see them sparkling and know that the property is spotless. Quite simply, you need have no fears over cleanliness. The property management company deserve a mention for the clean and tidy condition of the communal corridors and foyer. Maintained to a high standard. The flat has outstanding views - and is well presented and maintained. Everything you could want is to hand - right down to spare batteries for the remotes. The furnishings are good quality and in good condition - considering how many different people use the flat over the year. It is an ideal base and there is little better in starting the day with breakfast on the balcony watching the sun come up over Clifford's Tower. Within ease of the shopping centre this flat will prove to be an ideal base with no concerns to prevent you enjoying yourself. InYork Holidays do an excellent job in maintaining this property and once again Kim who met us - brought the milk with her. Just another touch which makes a 5th stay inevitable. You need have no fears here - book with absolute confidence.. Excellent location with fantastic views. Very central to everything in York. Extremely clean and with everything needed. A few very minor points are that the sofas aren’t that comfortable, the parking is a bit tight, blackout blinds are needed in the bedrooms, the soundproofing between the flat and next door is poor and there is a bit of noise from traffic on the nearby bridge and people at the pub across the river. However, it is nevertheless a good property and I would certainly stay there again and can recommend it. 18 Emperors wharf is a fantastic rental property maintained to the highest of standards. On arrival we were greeted by Richard, who showed us to our parking bay and helped to carry our luggage to the apartment. Richard gave us a detailed overview of the apartment and answered any questions. The apartment was in pristine condition. The views from the apartment are spectacular and would encourage you to spend longer in the living room just watching the world go by. York is a compact city best enjoyed on foot and we were so close to the shops and christmas market. During our weeks stay, we visited the Jorvik and railway museums and took the York Minster tour. We were fortunate that the weather was lovely, cold and sunny and we enjoyed walks along the river past Roundtree park and over the Millenium bridge and back down as far as the Kings Arms pub on the opposite quay. The pub is well worth calling in for a drink and to see the wooden post marking the heights that the river has risen to over the years. While the apartment is expensive for accomodation that only sleeps 3, the standard that it has been maintained and the quality of the furnishings plus the unforgetable views still make it worthwhile. Excellent location; a clean, comfortable and well furnished apartment. The location was wonderful - great views and plenty of activity on the river. The apartment was well equipped, clean, comfortable and homely. 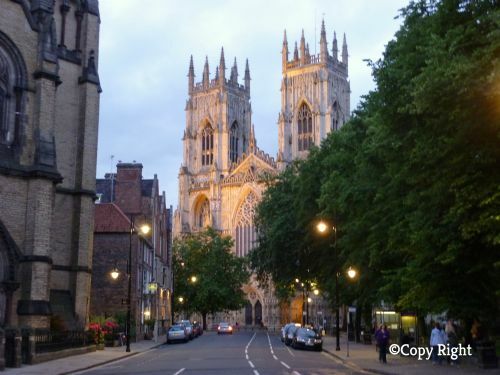 York city offers so much history, architecture and culture and everything is in easy walking distance. A highlight was a choral evensong service in the cathedral. An excellent week which I am happy to recommend whole heartedly. Just back from our second stay at this first class flat. We knew exactly what to expect and just to check, I opened a kitchen cupboard to look at the glasses - sparking and spotless ! This gives you all the confidence in the world, that the housekeeping team ensure everything is hygienic as well as being spick and span. Fixtures and fittings are good quality and still have plenty life left in them. The views are indeed the best, or among the best in York. We were met by Kim who made us feel welcome and had even bought us milk. Nothing is too much trouble for her and you immediately get the confidence that anything which needs dealt with - will be dealt with. The corridors and lift in the complex are again clean and pristine and everything points to a problem free stay. There is simply no noise from other flats and there is never anything to cause anxiety. The owners are to be congratulated on providing such high quality accommodation and for using such an able letting agent. The block is well situated for ease of reaching most places in York and whilst I note it seems to lose some points under the heading" value for money" - you get what you pay for and for a high quality flat with pristine fixtures and fittings - wonderful views and central location I would find it hard to grip about the cost. I would be very loathe to have to seek alternative accommodation on any future visit to this fine city. It is a great feeling knowing your accommodation is perfect. Great welcome. Well appointed flat. Great location with beautiful views. Balconies provided the perfect opportunity to eat ouside and watch the river traffic. Excellent apartment with magnificent views. Superb accommodation right near to bars and restaurants but far enough to be peaceful at night. My wife and I had a very enjoyable stay in this apartment in York. It is light and airy. It is quiet, and, being set on the River Ouse, provides very good views of the river's activities, particularly entertaining were the antics of the geese on the opposite quai. The apartment is very convenient from where to visit the major sites of the city. Richard, our meeter and greeter, is excellent. 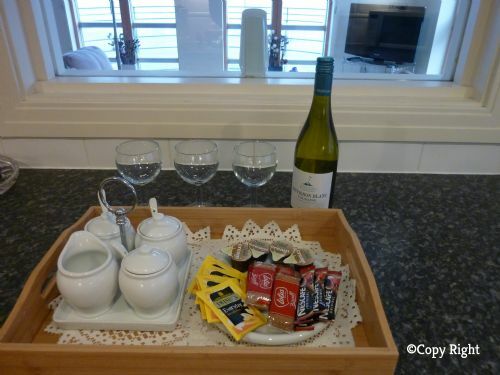 The flat is lovely with tea, coffee and biscuits on arrival, or wine! You can sit looking out of the windows all day, watching the world go by. We slept well on the comfy beds and the en-suite shower was a powerful wake up in the mornings. Driving into the garage area was interesting and the parking spaces are snug but then we didn't use the car again as we walked everywhere. I found Inyork emails a bit threatening in terms of arriving at the agreed time and so I wondered whether they were equally accommodating if their caretaker arrived later than the agreed time. This was enjoyment from first to last in a wonderful setting. Now, private lets are for a number of purposes. Normally the main reason behind a purchase is in hope of capital growth - secondly rental income and the hope of providing good holiday / rental facilities a distant third. Not here - I would go as far as saying the provision of quality accommodation is almost the prime purpose. Quality furnishings - quality crockery - high class fixtures and fittings - everything screamed out quality. Books and DVDs were also on hand - nothing had been missed. 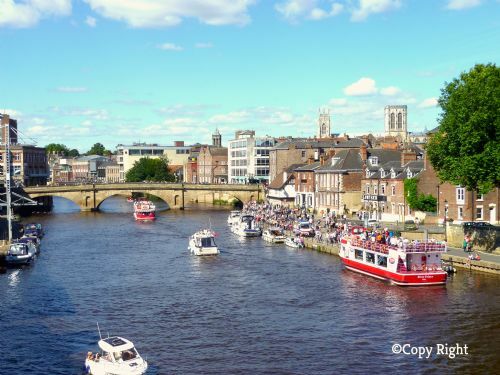 The views are breath-taking, possibly amongst the best in York and the whole block is maintained to a high standard by an excellent cleaning company and In York Holidays themselves take their responsibilities very seriously. Kim who met us was brilliant even to the point of buying us milk. This is the best flat I have rented and possibly the best company to deal with .I have come upon. For a quality break in stunning surroundings - look no further. This was our second visit to this excellent apartment and once again it was second to none. 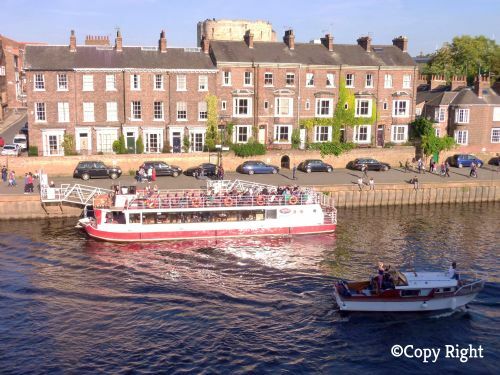 The superb situation adds value to the property, the river views from the balcony are possibly unrivalled by anywhere else in York. Mention must be made of the housekeeping staff as the apartment was pristine. Hopefully we shall be back.......Thanks for the wine! The flat was beautifully clean with lovely furniture and comfy beds. Fantastic location, we were shown round by a really helpful and friendly man. Loved everything about my week in York. A Clean, modern, well equiped apartment in an excellent location. 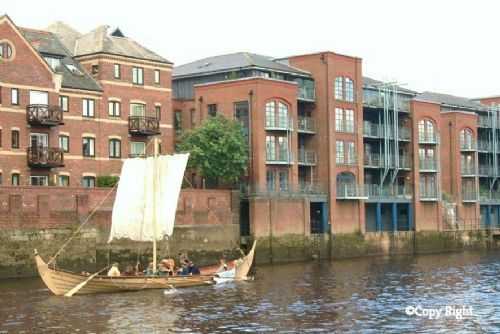 A Clean, modern, well equiped apartment on the riverside and within a stones throw of all of York's many attractions. Views of Clifford's Tower and York Minster. Excellent apartment in a stunning location. The apartment was scrupulously clean and the welcoming bottle of wine was much appreciated! All in all, a lovely place to stay. We had a lovely stay at this beautiful apartment. Very central location within walking distance to the city. The view of the river is just breathtaking. Parking was a bit tricky for our 7seater but manageable. Just hold your breath when you enter the gate! Will definitely stay there again and recommend others. Very pleased with the accommodation. Expensive, but good location and outlook. Very clean and well equipped. it good have done with some fans to move air around and possible black-out blinds in bedroom. Had a great stay in apartment overlooking the river. It was an excellent location for all parts of the city. It had all facilities and was clean and comfortable. The apartment was incredibly clean and comfortable, equipped with everything we needed and had the added benefit of parking. The views from the balconies were wonderful. It was just a short walk to the shops, restaurants and tourist attractions. It was surprisingly quiet at night and we slept really well in the comfy bed. We can't wait to go back. Enjoyed our recent stay at Emperors Wharf ,would definitely like to make a return visit some time. Location is excellent, complete with magnificent river views. Fantastic apartment in the perfect location for exploring York. Loved the views over and along the river, we're intending to return in the near future. 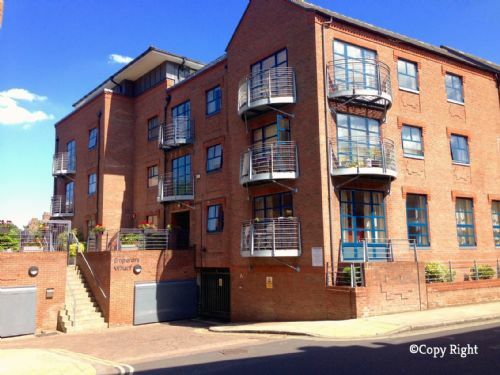 What a fantastic apartment, so convenient for all of what York has on offer. Lovely in quiet in the evenings so you can get a good nights sleep. It's hard to believe you are in the centre of York. Love all the modern furnishings and what a great view too. We will definitely return to this property. We came to York to attend the King Richard lll event in the Guildhall, so it was very convenient location wise. Marvellous views of the river and the geese were nice back ground sounds throughout the day. Lovely and warm everywhere, every wish catered for - even a bottle of wine in the fridge, tea, coffee and milk. Furniture and linen good quality and very comfy beds. Will certainly stay here again if visit York again. Very comfortable and clean apartment with brilliant views. Would definitely stay again. Perfect location with only a very shot walk to centre of york. This flat delivered everything promised on the website. You are paying top dollar, but if you're looking for a central location, great views and a quiet spot I don't think you could do any better. Service from In York was excellent and the housekeeping deposit was returned promptly. I would definitely recommend this property and would stay there again myself given the opportunity. Unfortunately for most of our stay the lift was out of action and we were not informed of this prior to our stay. Well equipped flat. Ideal walking location for Central York . Basement carpark would be tight if you have a big car. Modern and spotlessly clean apartment. Fantastic views. Walking distance to main attractions. Well equipped with many extra little touches. We couldn't recommend it more highly.